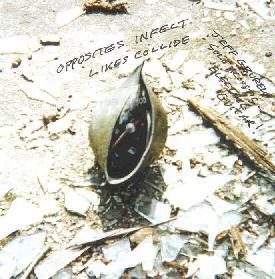 Jeff Gburek - "Opposites Infect/Likes Collide"
Recorded in Yamanashi Prefecture, Japan in February 2000, Opposites Infect/Likes Collide is a set of Jeff Gburek's solo acoustic and electric guitar works. On several of the tracks Gburek demonstrates the influence of his surroundings, injecting Japanese influences into the music while retaining a clear free-improv theme. We hear this particularly on "And Then Ten Bells Fell From My Fez" and "The Long Standing Goat" where Gburek does the Oriental themed koto freakout thing. It's nicely atmospheric, meditatively pleasing, and demonstrates Gburek's excellent musicianship too. "Heavily Pours The Rain On The Hat I Stole From The Scarecrow" is similar, but far more sedate and ambient. And at over 11 minutes the music has time to gradually evolve its Oriental cosmic noise-ambient motif. Getting into more aggressive territory is "Rhino's Eyestorm", a highly intense solo electric guitar workout that screams, wails and soars. "Who Dies And Leaves You Planet" is a spacey series of pulsating, (perhaps looped?) guitar attacks that I enjoyed. And "Red Mountain Monkey Lullaby" is one of my favorites, having an off-kilter Bluesy sound and some interesting horn-like noises. A captivating set of free-improv and creative guitar sculptures.